This is my fourth season doing the frostbite series, but my first 3rd place write-up. It goes to show that it is indeed possible to gradually improve over time! Sunday was one of those day where it was miserable on land, but turned out to be perfectly OK once we got on the water. Huge thanks goes to the RC team (Keith, Jim, and Jeff) for simply getting on with making the RC boat ready, and thereby nudging the rest of us into drysuits (before rigging! ), and then subsequently running 6 windward-leeward races on a well laid-out course. The wind was around 12 knots coming out of the North; it swung slightly towards west as the afternoon progressed. The tide was very strong and running out throughout racing. I think there were two key things for me today. First (as always..) the start is key, and I focus a lot to be on the line at start. I try always to check to see what end is advantageous (today it was mostly the pin-end, I thought), but my main priority is to hit the line on time. As it happened, in several races today I managed both to be on time and in the right end (it will probably be a while before that happens again). The pin-end also had the advantage (I think) that it put you on the left side of the course where I thought the tide was slightly lighter. One more thing that I try to do is to force myself to ONLY focus on sailing fast for the first 2 minutes after start (at least when I am on starboard and am in a free lane)—I tend to lose a lot if I look after other boats immediately after the start. Second, I try not to make too many mistakes. I find it often better to be quite conservative, especially when the wind is up. For example, today I was generally very careful to have ample room at the windward mark—when the tide is as strong as today, it’s a killer to try to pinch around the mark. Similarly at the leeward mark I didn’t mind too much giving up the inside lane in favor of having more room to make a good jibe and hit the upward leg at a good angle. Overall, I made only one serious mistake today (when I—against my better judgment— picked a fight with Len at the windward mark and ended up hitting it..). Last, let me just say that I really appreciate all the advice that many of the more experienced members of the fleet so generously share. There are a 1,000 things to learn, and it is really helpful to get some tips! Sunday the wind was great and picked up throughout the day, which I really liked as I had to hike. During the races I played a lot with my controls (Vang, down haul, and out haul) to try and find my perfect set up. The pin end of the start line was very favored and it was almost not possible to sail from the committee boat to the pin, but I liked this as it was challenging to get a good spot on the line, while also being able to keep it and get off of the line with speed. 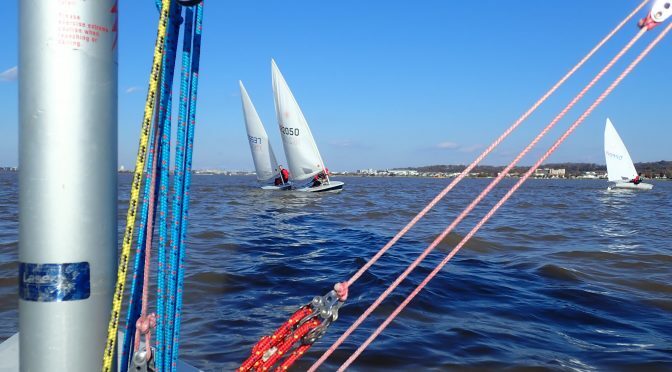 During the first few races I tended to go up on the port side of the course all the way to right below the lay line and then to tack over, but as the wind increased it shifted a bit and the starboard side of the coarse was favored in the last two or three races. I am never very aware of the current (which I should probably be) but throughout the day it was going out. I am definitely going to wear like 6 pairs of socks next Sunday, because my feet were frozen. Frostbite Series #2 and #3 have been great conditions, good turnout, and fun racing. I regret missing the first weekend. As always, a thank you to our underpaid Race Committee. I was initially skeptical of the leeward gate setup, but variety is the spice of life (it was fun)! 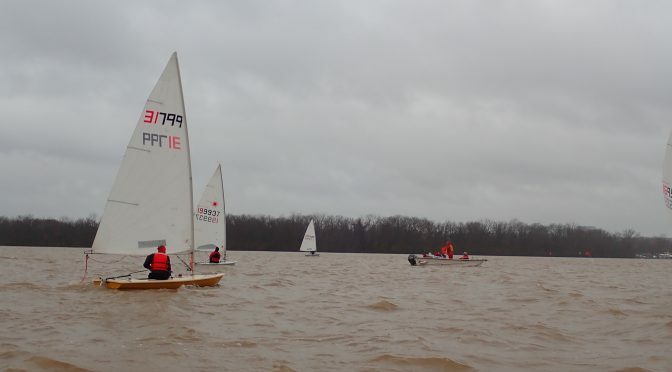 Conditions were mostly steady from the south, but became light in race 14 (I think). The last couple races we started to see some significant starboard tack lifts with boats stacking up near the committee boat and puffs from the western shore. A flooding current wasn’t as aggressive as last week’s ebb current, but still worth accounting for during mark roundings. Tactically, I don’t think I had a favorite side; sometimes I went left, sometimes right. I generally tried to be on the line, have clear air, and not mess with other boats. At least two starts, I severely mistimed and was deep off the line. I immediately tacked out from the fleet to get clear air and play catch up. I find that I perform my best when I sail my own race and concentrate on speed, shifts, and sailing where I want to sail. Sometimes that meant an aggressive duck rather than leebowing a starboard tack boat (to avoid boxing myself in or wasting concentration on fighting the one boat next to me versus the fleet at large). My best race, was when the wind lightened up (again, I think race 14). I eased the mainsheet, probably about 10-inches block-block and focused on weight/boat flatness, keeping the boat powered up, and tacking on shifts. Due to the leeward gate, the fleet seemed to split pretty early just after the windward mark so I found the runs a little less stressful than normal. For finishes, it seemed like boats that rounded the easternmost leeward gate and finished near the pin tended to net better and I lost several places even when I was ahead going into the gate by finishing near the boat. Lastly, I’d like to thank my corporate sponsors, Intensity sails for their MKII practice sail (just kidding, but I will thank them nonetheless). 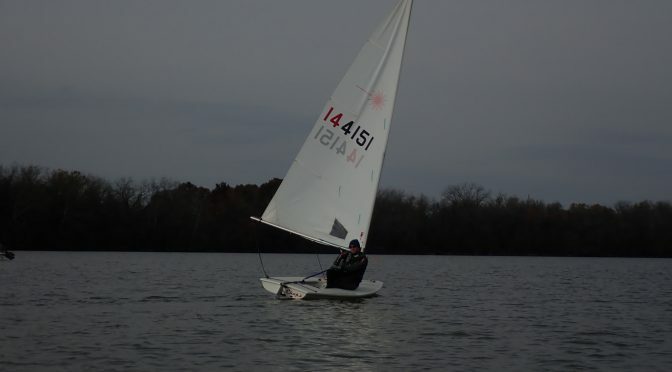 I have only used the MKII sail these past two weekends, but I have really enjoyed it. I am not going to outright say it is a faster sail design, but I think I can make the boat sail faster because it seems to look/perform more like other sailboats I’ve sailed. Again, I’m not saying you can buy your way to speed, but I am giddy when looking up at a pretty sail while racing (maybe its all about the right emotional attitude). Anheuser-Busch, what can I say, other than Len wants everyone to drink the free Bud light he’s been offering. Another day of fantastic conditions for the 2018-2019 season – something we’ll find hard to recall in February. Fleet captain and PRO Tom Hutton with Helper Jacob Donkersloot did a great job in setting a nicely-sized, well-positioned course and rolling through an interesting ‘variety pack’ of races – four Olympics, one triangle and a windward-leeward. Light westerly winds were forecast, but the actual winds during racing were similar to the week before – steady 6-10 knots oscillating around due south, with some pronounced short puffs. I think this had some thermal aspect as DC heated up in the afternoon sun, with a reversion to lighter westerlies as soon as the sun started to dip at the end of racing. Plenty of current this time – full ebb tide during racing combined with post-rain flow of river. This led to some tricky starts (including a few generals) and close-shave leeward mark roundings but fewer tactical angles than I expected – the overall flow seemed somewhat even across the whole course? Still, the current put a strong imperative on clear air on the downwind leg – I think this accounted for the frequent bunching of a pack behind the leaders in clear air who seemed to consistently break out on either side. Like last weekend, neither side seemed consistently favored upwind. I usually started at the pin for clear air and tactical room for error re the current. I also originally thought the DC side would have deeper water and so stronger favorable current – but didn’t seem to play out that way. Starting mid-line and up the middle probably would have paid more consistently – but you need to reliably achieve a good start and I’m not there yet. Light-air reaches are unusual in weekend racing – but they turned out to be very interesting. As always, it’s hard to make dramatic gains in the ‘parade’ but incremental advance & hold was possible. I found it wasn’t always worth trying to get the inside at the reach mark – a few times going on the outside of the pack and staying low and by-the-lee seemed to pay. Perhaps the current helped in that case? Anyway, I’m going to put more thought into reaches in future – some subtle stuff going on there. For most of the races, the downwind leg was after boats had separated on previous legs – but I noticed there was a lot of bunching, I’m guessing from the interaction of wind shadows and adverse current. Like last weekend, I found going for clear air right after the windward mark was key, followed by always playing one side or other, by-the-lee or slightly hotter (never DDW). The little wavelets that arose from wind vs. current could occasionally add a vague simulacrum of surfing if you could catch ‘em. Perhaps not actually effective for racing but fun-ish – yeah, I’m easily amused. Very pleasant conditions for 2018-2019 season kick-off. Many thanks to PRO Todd Blekicki and Helper Tyler Phillips for setting a well-positioned course and efficiently rolling through 5 races. As more-or-less promised in the forecast, winds were steady 5-9 knots velocity with direction oscillating tightly around due south. Tide was incoming, but I didn’t see much current effect during racing – maybe post-rain/snow flow of the river cancelled that out? Also, the course was generally between the two channels so that helped. With a square well-sized line, steady breeze and no big current effect, neither side seemed especially favored on the upwind leg. The slight oscillations in direction and pressure cycled fast enough to cancel out. All of which led to close bunching at the first upwind mark and a lot of, ah, ‘intricate’ boat maneuvering. Good way to knock off some rules and boat handling rust, no? In these conditions for upwind, a mid-line start is ideal but clear air is absolutely critical. If you’re not a great starter (e.g. me), the pin seemed to work out as a way to stay clear and focus on boat speed. But the risk there is coming back in and having to face an ugly wall of starboard tackers. So I decided in the last race to ‘practice’ a mid-line start and – predictably – it was less than ideal. Useful lesson for this frequent occurrence is to bite the bullet and get to clear air as quickly as possible. Downwind for all the races seemed to offer some subtle tactical gains. You could play the slight oscillations and stay out of the wind shadows by alternating between by-the-lee on the VA side and a little hotter to the MD side depending on the puff-of-the-moment. That worked out well for me in the first four races but in the last I took it too far to the MD side when I saw the VA side looked crushed (momentarily as it turned out) and lost several spots. Know when to fold em’, eh? 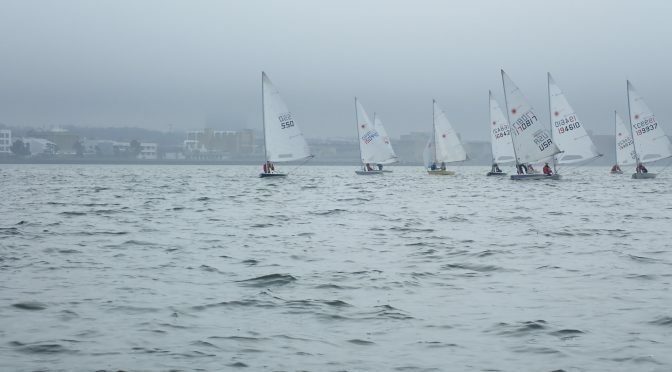 Thanks to Tom Hutton who gave up a day of sailing on a sunny day to give us the opportunity to race on the last day the frostbite season. The NNW to NNE light to nearly non-existent breeze and a strong ebb tide made for challenging starts and windward legs on the four one lap and one two lap races. Today we had light turnout and light shifty wind. For those that chose not to come, I think it was the wrong decision. It was a super nice day with temps around 50 and abundent sunshine. The wind ended up coming from every direction and was mostly between 1 and 5. Jim and Melissa did an excellent job running the races and changed the course 3 times to try and account for the shifts. It ended up playing out that 3 of the 5 races were reaching races. The other two started of with the wind coming from the windward mark but shifting during the race. I found with the light air, it was helpful to sit on top of the dagger board most of the day. Also starting well was helpful. While my position was fine for the starts, the people that came to the line with speed tended to be the ones in front. Something that is important to remember the when the start line is parallel to the wind with the pin to windward is that starting at the pin can get you pinched out by the leeward boats that can head you up. One more week left so I hope to see everyone out next weekend! The race committee (thanks Nabeel and Francisco) smartly kept the marks in place for the second race but renamed the marks from leeward to windward, and windward to leeward, so you might call that a shifty day. In the second race i started on port on the right end of the line while the fleet sailed on starboard on the left end of the line, and in a very light wind once around the course, maintained a lead and won. On such a light shifty day the key for me to keeping the boat moving was watching the windward boats for indications of possible shifts, and sometimes powering up by bearing off on short term headers instead of tacking. Today the wind was rather shifty and it picked up and died down a lot. For me it was pretty challenging to tack in the wind shifts as the occurred mostly in the lighter wind. I feel that the most important aspect to keep in mind on a day like today would be to have clean air to keep your speed. Before going out I thought there was going to be a lot of wind, but most of it died down before the first race. I placed third in the first few races, which I think is mainly because I tacked out of dirty wind and I was able to somewhat control the wind shifts. In the last race however, and I’m pretty sure many can relate, the wind was way to light and I had difficulties getting off the start line. I can’t recall what sides were favored in which races, because it was so shifty, but I feel that in general the left side was favored to most people. In the last race when the wind died down, the course was a reach in both directions, which I actually liked as we didn’t have to adjust to shifts as much. I had a lot of fun on the water and the races were pretty competitive. There was a lot of current today. During the first race several people noticed as setting up near the pin was a sure way to not make the start. Thanks for John Van Voorhis and Cliff Bartlett for doing the RC today and working diligently to square the line and give us a nice mix of Olympic and WL courses and they even used the flags!! 🙂 Also a big thanks to John for offering to help me launch and retrieve the 19’ boat when I had RC last week. I hope no one reading this is hoping for a lot of technical insight as to shifts, persistent or otherwise, I’m pretty sure I would not know one from the other. Overall my mantra is to slog it out as best I can, keep the boat flat and hike as much as my body will allow me, and of course try not to make any mistakes or cut things too close. First, I benefited greatly from having ½ the fleet coming late to the start of race 1. That gave me a big boost in the day’s score. Being on time paid off for me. When the start line is square (as it was in most races today), I find I sometimes do better coming in on port and searching for a hole about 15-30 seconds from the start. You have to be really quick though with your tack, because there is little time and space between the starboard tackers. So it’s a little risky. In one case, however, it really paid off because I was able to stay on port by threading the needle as they say, and in that particular race ( I forget which one) a port tack was favored. In that last few seconds before the start you really do need to head down off the wind and power up, and accelerate so that you are up at full speed when the gun goes off. That seems to be the only way to have a good race. So if you are going to concentrate and be on your game, these first 10 or 20 seconds after the gun goes off are the most critical. I had my cunningham very tight, outhaul about 2” off the boom at mid point, and the vang ¾ on. The tight cunningham helped me when the puffs came so as to not be overpowered. I pretty much tried not to sail out to the lay lines too much as a shift in wind could easily gain you several boats if you tack quick enough on the header. As it was very quirky and puffy, I did my best to ‘ease-hike-trim’ whenever I could, and a few times I could really feel it working, and I was gaining on other boats. As for when I would tack, that pretty much was determined by my looking at the luff of my sail, and when it started to collapse in (ie a header), I would throw in a tack. On the reaches, I would pull my board up ½ and ease the cunningham off all the way and then adjust the vang to as to get the best sail shape I could get. My cunningham does not seem to come off unless I go to the mast and pull on the slack of the line, so I found myself doing that a lot today. Cunningham all the way off, board up 1/2 , outhaul about 2” off the boom at mid point, and the vang adjusted until I saw a good sail shape, which oddly, meant putting on quite a bit of vang. 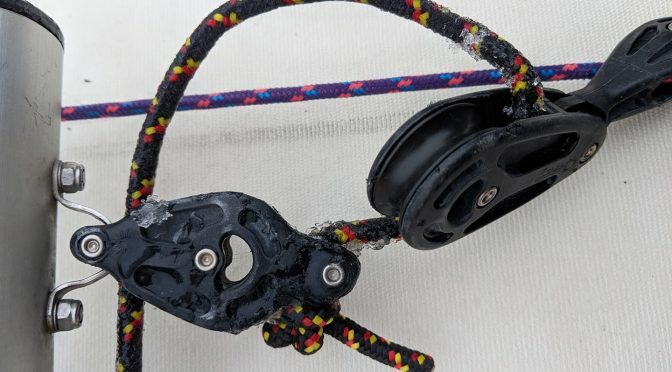 I was worried about death rolling in the puffs, and managed to stay flat by looking back all the time for the darkness in the water, and then when it hit, I would use aggressive mainsheet trimming to dampen out the oscillations. But when the wind comes from the west like that, it can cause a lot of deathrolling. So on days when it’s windier, if I feel I might deathroll, I quickly sail off on a reach and pop up on a plane and do the best I can that way. Better to be up on a plane, sail a little longer, and then gybe when you feel in control (or even chicken-tack if it’s really windy). Nothing is slower than going for an unwanted swim. One final thought, it pays to look up at your sail shape as often as you can. I am doing this now more than I used to in the past ( I think Len mentioned that once or twice to me). So in going downwind, again for some reason it seemed like I had to put on vang for a nice shape, and I know most people ease their vangs going downwind, so I don’t quite know what caused that. Maybe it’s the new sail that has not yet broken in.